Intex is a renowned manufacturer of above-ground inflatable and metal-frame pools. To keep these pools clean and sanitized, Intex sells its own line of pool supplies, and one of them is a saltwater chlorination system that works by extracting sanitizing chlorine from ordinary salt. While these systems can require less maintenance than other sanitizing systems, occasionally they may need attention. 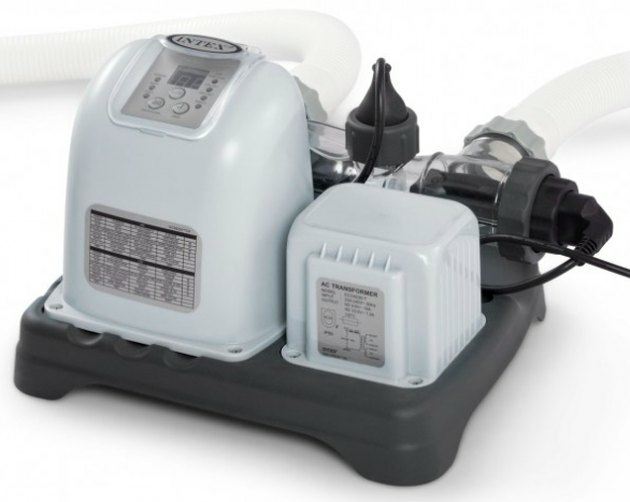 When operating correctly, a salt-water chlorine generator will keep a pool crystal-clear. Some of the common problems with an Intex saltwater chlorinator will become obvious via symptoms that are visible, or due to evidence presented by chemical testing of the water. But Intex also has a helpful system of LED display lights that can identify some common problems that are not immediately obvious. This may be caused by one of the following, and there are steps you can take to rectify it and obtain the proper chlorine level. Insufficient operating time of the saltwater chlorinator: Increase the daily operating time of the saltwater chlorinator. Salt level in pool water is less than 2,000 ppm: Check the salt level, and adjust as needed. Excessive sun exposure has evaporated chlorine: Use a pool cover when the pool is not in use. Number of swimmers has increased: Increase the daily operating time of the chlorinator. Electrolytic cell is clogged or dirty: Remove the cell, inspect, and clean if necessary. High UV exposure: Apply a pool cover for two days without using the pool, and then test the chlorine level. Drain 20 percent to 25 percent of the water, then add fresh water to dilute the calcium concentration. Inspect the electrolytic cell for scale buildup, and clean if necessary. No power supply: Make sure the cell cord is firmly inserted. RCD/GFCI outlet has tripped and has not been reset: Reset the outlet. LED lights have failed: Seek help from Intex service center. The Intex saltwater chlorine generator has an LED display on the top of the housing that will flash a code to identify common problems. Intex salt-water chlorinators have an LED display that will light up and flash a numerical code number that identifies possible problems with the system. Filter pump is not attached to the system, or the switch is not on: Make sure filter pump is attached and is operating. Circulation line is blocked: If the unit has plunger valves, make sure they are open; clear dirt and debris from filter cartridge and cell; release all trapped air in the circulation line. Hose direction is incorrect on inlet and outlet hoses: Check the direction of the inlet and outlet hoses, and reverse them if necessary. Scale has built up on the flow sensor: Clean the flow sensor, paying close attention to the hinge. Flow sensor cord is loose**:** Make sure the plug on the flow sensor cord is securely inserted. There is a timer conflict between the filter pump and saltwater system**:** Reset both times. Flow sensor has failed: Contact the Intex service center. Dirt or scale has built up on the titanium plates: Remove the electrolytic cell and inspect it; clean it if necessary. Low salt level, or no salt: Add salt to the system. Electrolytic cord is loose: Make sure the plug is securely inserted. Electrolytic cell may have failed**:** Contact service center; replace cell if necessary. This code indicates the salt level is high. To remedy, partially drain the pool and refill it with fresh water. This generally means that there is no power or insufficient power to the system, and it may be because the household voltage is too low or too high. The Intex system is designed to work within 20 percent of the device rating. If problems persist, contact the service center. Bryan Trandem has more than 30 years of experience in gardening, home improvement, woodworking, and home decor. He lives in Minneapolis, MN.